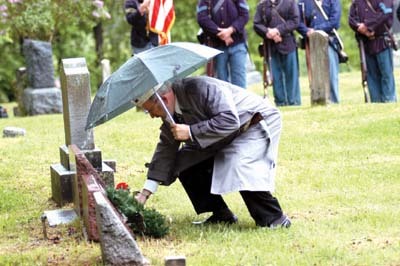 ERIC NYSTROM, DIRECTOR of the countys Veterans Service Agency, lays a wreath at the base of a veterans headstone in Fremont Center on a very rainy Memorial Day. FREMONT CENTER  May 30, 2003  Honoring the nations fallen military heroes is a long-standing tradition in the Town of Fremont. In 1884, the rural community held its first Memorial Day Parade to honor veterans of the Civil War. Despite the rain, the parade went on as scheduled. It started with a graveside service at the final resting place of PFC Jacob Gross (born in 1913) who was killed in action at Salerno, Italy during WWII in 1944. Following the invocation by Franciscan Father Ignatius Smith, a former chaplin in the U.S. Navy, Verl Ringgenberg addressed the small crowd, most of whom were taking shelter from the rain under umbrellas. As long as two comrades survive, so long will the Veterans of Foreign Wars on the United States render tribute to our heroic dead, said the commander of Allan Milk Memorial VFW Post 7276 of Long Eddy. On this day, forever consecrated to our heroic dead, we are assembled once again to express sincere reverence, Ringgenberg added. This grave represents the resting places of many departed comrades who served in all wars. Ringgenberg began his military career with the South Dakota National Guard in 1955. A year later, he joined the U. S. Navy and retired from military duty in 1973. Members of the 143rd New York Volunteer Infantry (NYVI), a recreated Civil War company recorded in history as The Sullivanites, stood quietly at attention by the edge of the woods overlooking the graveyard. Commanded by Capt. Charles Chuck Young of Liberty, the company of soldiers included colors bearer Seth Kleinman and infantrymen Dennis Bernitt, Scott Bernitt, Ken Bascom and Joseph DiGiameaolo. At the appropriate moment, muskets flashed three times in rapid order as a salute to the countrys fallen servicemen. Art Flynn, commander of H. Russell Kenyon VFW Post 5808, laid the memorial wreath at the graveside. He was followed by a trio of flower bearers, each of whom laid a carnation at the base of the headstone: Sandy Flynn (blue flower), Allen Kellam (white flower) and Eric Nystrom (red flower). The graveside service ended when Ringgenberg placed a small American flag next to the granite marker. Two old soldiers and a navy veteran were joined by two comrades from more recent wars, as they watched the somber ceremony in the rain. John Knise fought in Italy during WWII; Earl Heath was a POW in Germany from September to May, 1945 until he was liberated by the Russian Army; Edward Killy served with the U.S. Navy in the Pacific Theatre; Butch ONeill put in two tours in Lebanon with the U.S. Navy; and Mike Knack served with both the U.S. Navy and U.S. Army, where he trained chopper pilots headed to Southeast Asia during the Vietnam War. Then it was time for the 119th Annual Town of Fremont Memorial Day Parade. Parade marshals included Anton and Charlotte Dietrich of the Town of Fremont, Ret. Major Arnold and Patricia Baum of the Town of Delaware and Earl and Gladys Kinney of the Town of Callicoon. Trophies were awarded after the parade. The judges choice award went to the East Ridge Drill Team. First, second and third place trophies were handed out to local volunteer fire departments: respectively to Hortonville, Protection Hose Company #1 of Jeffersonville and North Branch. Float prizes went to New Breed 4-H Club, 4-H Moo Juicers and the Kenoza Lake Hummingbirds. Special Scout awards were presented to Boy Scouts of America Troop 106 and Sarah Wells Girl Scouts of America Junior Troop 590. Judging the parade were Barbara Hahl, AnnMarie Lohr, Jacky Robisch, Fred Winkler and Patricia Winkler. Despite the inclement weather and rumors that the parade had been cancelled, little 4-year-old Cassidy Bascom of North Branch had a great time watching all the marching firefighters, a local drill team and lots of flashing red lights. As the Civil War reenactors let loose a volley of musket fire in front of the judging stand, she held her ears and raced over to her grandmother, Jane Bascom of Mt. Vernon. Earlier in the morning, Kleinman set the tone of the day. After all the speeches and ceremony, he furled the rain soaked colors and walked quietly away from the cemetery.